It's going to be a big year for blockbuster movies, which means there will be lots of great costume choices once Halloween rolls around. 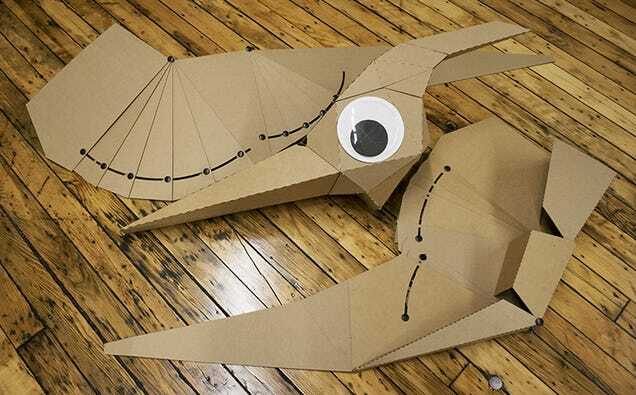 And if you're partial to the upcoming Jurassic World and its dinosaurs, you'll love Lisa Glover's simple pterodactyl get-up, made from completely recyclable cardboard. With an impressive wingspan of 4.2 metres (14 feet) when fully assembled the cardboard kit is sure to win you a costume contest or two come October. But it's been cleverly engineered with collapsing wings and flexible joints so that you can still squeeze onto a train or bus while wearing it. Before you climb into the roof of a building, though, it's important to remember that this cardboard costume will unfortunately not help you fly.